Yep! You guessed it right. This is my entry to JFI: Special edition by VEE of Past, Present And Me. This Diwali, I wanted to try something different in the sweet arena. Back home, the usual stuff made during this festive season range from adhirasams, halwa, Boondhi laddoo to badhushas and the like. I neither have the tools nor the patience to make all these, but my DH has quite a sweet tooth for laddoos. So, not having the heart to disappoint him, I went hunting for an easy way to make laddoos. That was when this recipe struck my eye or rather ear I should say, having got it from my mom over the phone. 🙂 Simple, easy and delicious is the way to describe aval laddoo. Over to the recipe now..
Roast rice flakes till golden brown. Grind together the roasted rice flakes, cashews, pistachios, sugar, cardamom and the coconut into a fine powder. 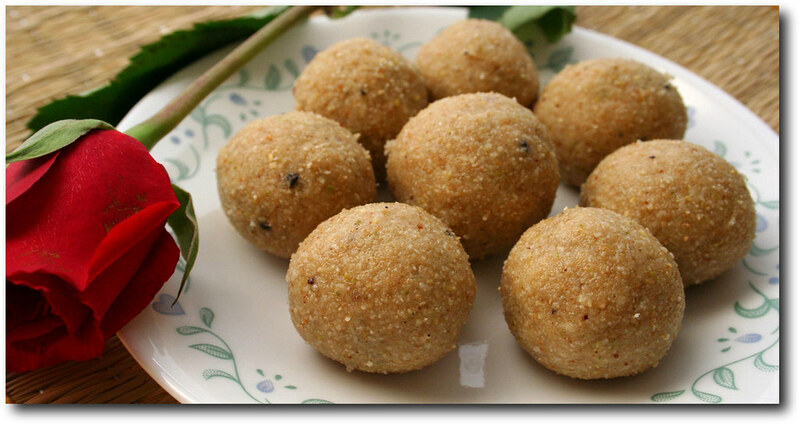 Add hot melted ghee to the ground mixture and shape into laddoos. Ghee helps to keep the shape of the laddoo. Adjust the quantity of ghee accordingly. Take care not to burn the rice flakes. You can add more coconut and more nuts as per your taste. Oh, I forgot to mention, my DH loved it and I am wondering if I should make another batch, as this one’s not gonna last till Diwali day! This is my entry into VKN’s Virtual Cooking Competition Q3 2006. Today is World Bread Day. 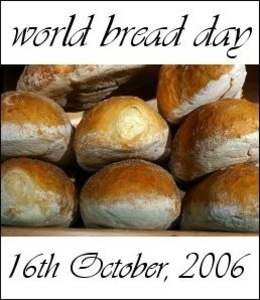 The International Union of Bakers and Bakers-Confectioners (UIB) have declared 16th of October as World Bread Day. I got to know of this when I chanced upon Zorra’s site, who is hosting a bread blogging event and has invited all bloggers to bake or buy a bread and blog about it. You can get more information from Zorra and from Paz. I had been wanting to bake a bread for so long and I thought this was a perfect opportunity, but alas time was not on my side. So, I have brought the bread which Sai and I relish the most, to limelight. 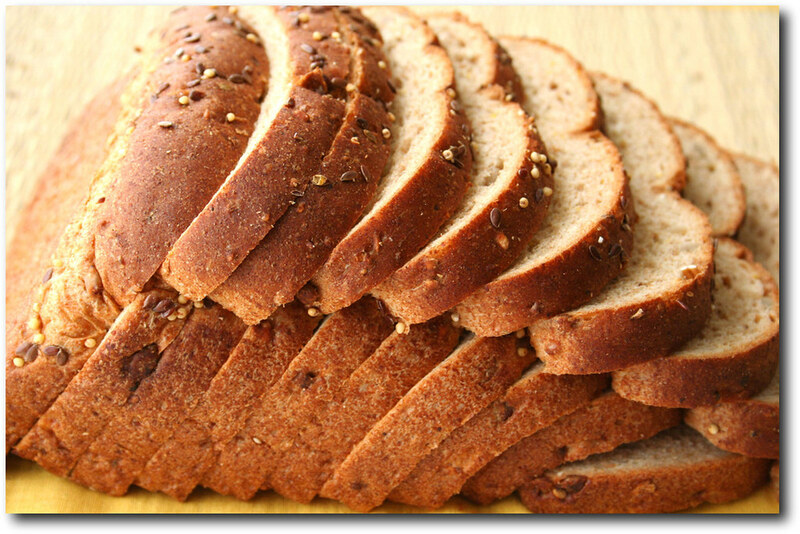 It is a whole wheat bread packed with 15 grains, a hearty texture and a wonderful flavor. This store bought bread is an important part of our breakfast and we normally eat it with butter, jam, honey, cheese or plain because we simply love it! I chose this particular recipe because it talks of butter and butter alone. I made four types of flavored butter and they worked wonders on my toast. The basic method is the same for all the butters. Soften butter to room temperature. Add the ingredients and mix thoroughly. Refrigerate for an hour, for the flavors to blend. When making a good amount of flavored butter, you can wrap it in waxed paper and refrigerate it. Sky is the limit when it comes to ingredients. 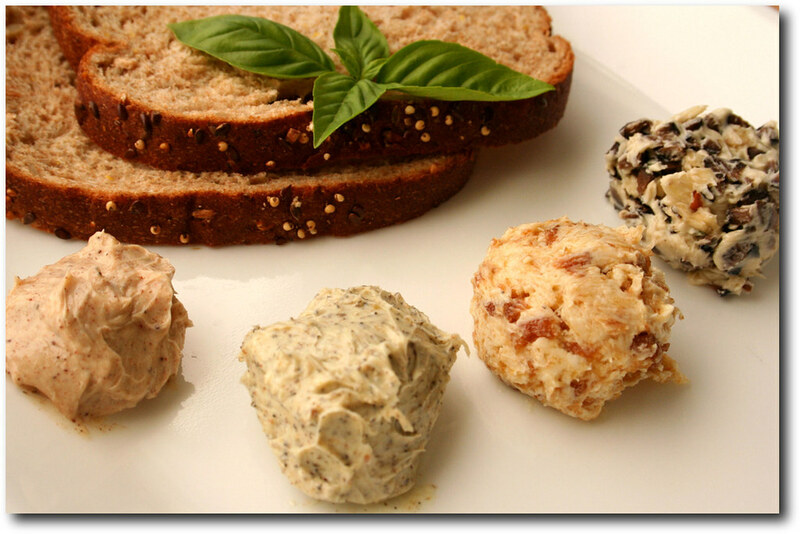 In the picture, from left to right bottom are Sweet Butter, Spicy Butter, Fruit Butter and Olive Garlic Butter. Ground Ajwain – 1/8 Tsp.